Becoming successful at forex trading can be life-changing for anyone. There is a possibility to earn huge amounts of money by trading currencies. But first, there is a lot of knowledge to gain before you perfect your skills and can finally start trading like a pro. In order to learn everything that’s needed to be a successful trader, you have to be willing to put in a lot of time and effort. We recommend several serious forex brokers that all provide trading material and videos, which is the best place to start. Read everything you can find on the subject and watch every video and tutorial offered to learn the basics of currency trading. It is important that you have a solid basic knowledge before you continue. The next step is to learn more about specific strategies that you can implement with your trading and use to make better decisions for profitable trades. Most forex brokers offer educational material for strategies as well, but you also have the opportunity to learn from other traders on social trading networks and forex forums. Before we dive headfirst into the different forex forums that are offered and which ones you can use to perfect your skills, we want to talk about what is most important to learn. To become successful in forex trading you need to find and develop strategies that fit your goals and trading style. Without a strategy, you will be trading blindly and won’t have a chance to grow or make any money. A forex trading strategy can be based on anything from how long the trade should be, what time of year it is, what currency pairs are involved, etc. There are tens of thousands of strategies to use and most people end up creating their own systems based on their needs and experience. The best way to learn more about the strategies that successful traders use is to contact them through forex trading forums. We’ll tell you more about this in a second. Go to the section called Forex Strategies to learn more about basic strategies and how you can develop your own. 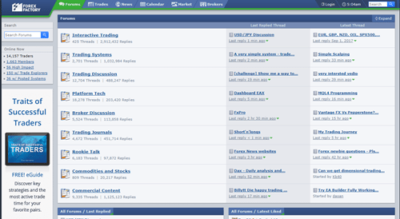 The easiest way to learn more about strategies is to read and follow forum threads about forex trading. 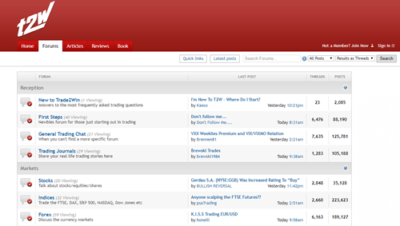 A lot of the topics discussed in the forums can be repetitive but sometimes you stumble upon threads full of valuable information from some of the world’s leading forex traders. These are the opportunities that you need to take advantage of. Another positive aspect of forex forums is that they let you learn from others mistakes before you make them yourself. This means that you can get to the top much faster and without losing as much money on the way. Many of the big forex brokers offer forex forums as a part of their website, but in our experience, these tend to be quite unimpressive. Instead, we recommend that you use bigger and more well-known forums such as ForexFactory.com and trade2win.com. Both of these forums have several hundred active threads at any given time and they are full of useful information for anyone who is willing to read through them. You can, of course, also find other forums by searching for them online. If you speak a language other than English or if you live in a non-English speaking region of the world, you might be able to find forums in that language or for that specific region. There might even be strategies that are region specific so don’t limit yourself. One service that more and more forex brokers are offering, either as a part of their educational material or as a separate product, is social trading networks. They are basically social networks just like Facebook or Twitter that are solely focused on forex trading. Normally, they offer the possibility to connect and communicate with a large network of traders from all stages of life. 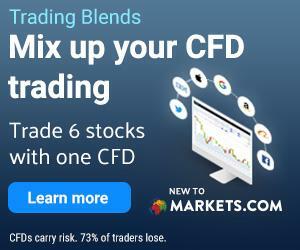 These social trading networks often come with a copying function that lets you copy other more successful trader’s strategies, patterns, settings, and signals. This is by far the easiest way to find and test great strategies that have already been proven to work. In our Etoro review, you can read more about social trading/copy trading. Strategies have to be a part of your investment plan regardless of how serious you are with your trading. It is definitely important that you try and develop your own strategies, and one of the easiest ways to do this is by studying what other traders do. Therefore, every serious trader should consider signing up for at least one of the bigger forex forums to actively look for patterns and system that are working for others.